I picked up Wii Sports Resort the other day, and playing it reignited something that burns me about recent trends in videogame design. I get the feeling that fewer videogames are being built upon thoughtful design, clever problem solving, and storytelling. In contrast, it seems that there’s an abundance of games that feature mindless collecting, whiz-bang toys, pointless achivements, crap user-generated content, and an abundance of make-your-own-fun sandbox simulations. It all reeks of lazy game design and disrespect for the player. I don’t want a box of toys that I could use to possibly make my own fun. I bought a game damn it. Set an objective. Teach me the rules. Challenge me fairly. Don’t make me do menial tasks. Give me a dozen good levels over a million ordinary ones. You can’t placate me with your hollow achievements! Don’t patronise me! Designing for “emergent gameplay” tends to be the gaming equivalent of producing reality television – it’s easy and cheap to produce. Just create the set, plant a few challenges, and wait for the “magic” to happen. “Sandbox gameplay” is a often catch phrase for providing the equipment for a game, but no game itself. It’s like kicking a ball around. It’s exercise, but it’s not sport. Football is what people dedicate their lives to. It’s easy to see why game developers would seek to include these new types of gameplay (maybe they should just be called “play”). They’re low-hanging fruit and seem to appeal to a broad market. I’d also throw in that people can be very insecure (and companies very adverse to risk). Why risk designing something that consumers might not like when you can just provide them some fun toys and let them do whatever they want? There’s nothing inheritly wrong with toys (or reality television). Why don’t we just call them toys though? I don’t want to see games always seek to include toys to supplement poor gameplay or to cover the lowest common denominator. And now back to Wii Sports Resort. As expected, it’s a collection of fun toys and shallow games. Fortunately, it doesn’t purport to being anything else. I find it fairly difficult to remember what it was like to be a child. All of my childhood memories feel like a distant dream. I can remember the feelings, but very few of the details. I haven’t posted much recently as I’ve been busy with various things including helping to organise the next Let’s Make Games event and looking into buying a house (at some point). 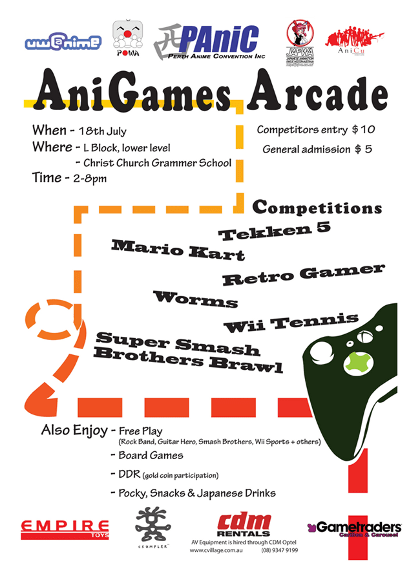 I seems that almost all otaku groups in Perth (PAniC, UWAnime, POWA, JAFWA and AniCu) are working together to run a videogames competition this weekend. We took a bunch of still images and I used GIMP to create this animated gif of it tearing up LEGO grass (and a little bit of background paper).